Once again, Barney’s Farm has dived into the seeds bank to make a beautiful crossing. They have very well succeeded with the weed seeds of the Critical Kush. Once again, Barney’s Farm has dived into the seeds bank to make a beautiful crossing. They have very well succeeded with the weed seeds of the Critical Kush. Do you like indica and do you want to get high in a way that it feels as if you are getting a powerful punch? 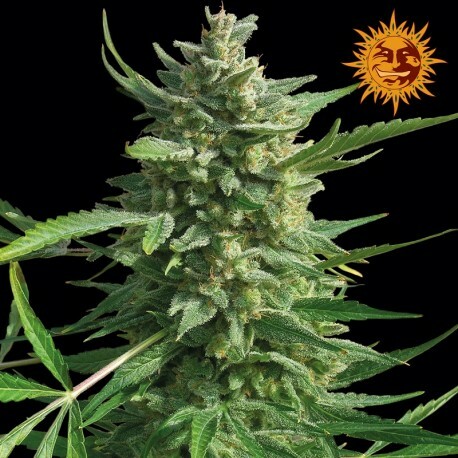 The feminised Critical Kush weed seeds provide you with the cannabis you need for such a sensation. These cannabis seeds are the result of a crossing between the OG Kush and the Critical Mass and guarantee a plant that flowers after no more than approximately 8 weeks. Just the scent and the appearance alone (the crystals are very clear) make you want to cultivate these cannabis seeds. Furthermore, that typical taste of real Kush will be added during the smoke. Make sure you have enough storage space because the cannabis seeds of the Critical Kush provide an enormous yield!